Sunday morning, I stopped at Starbucks on my way to meeting, and found myself on line behind a small girl, holding her father’s hand. I had noticed them in the parking lot, as I pulled in, because of their bright colors. He was wearing an orange t-shirt with his jeans, and she was wearing an aqua sweatshirt and a pink hat, of the style known to hat people as a trilby. 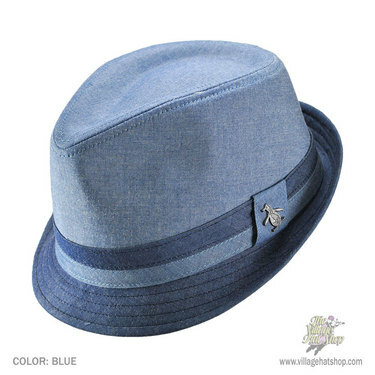 Here's a picture of a blue trilby, because I couldn't find a pink one. So, I’m standing in line behind this little girl, and I’m looking down on her pink hat, with her blond curls spilling out from under the bucket of her hat, just reaching the aqua sweatshirt, and just when I’m thinking it couldn’t get any prettier, she turns around and looks at me, soft, round face and light-colored eyes. She giggles, and tells me she isn’t getting coffee, then turns as the line advances, and starts showing the girl at the cash register the greeting card that she and her father had just bought next door at Walgreen’s, and telling her who it is for, and why. As I wait for my espresso, I watch the girl in the pink trilby playing with her father at a nearby table, and I am very grateful that I am not the only one who hasn’t yet learned not to talk to strangers. In fact, I think that is a rule we would all do well to forget, as soon as we are beyond the vulnerable age. This entry was posted in Found Stories and tagged children, coffee, hats, kids, Starbucks. Bookmark the permalink. I also love talking to strangers. I always learn something interesting, and it reminds me of the fundamental uniqueness of the zillions of strangers I pass every day. I especially like how sometimes as small as two random strangers connecting for a fleeting moment can have significant (and positive) impact. A couple months ago, I was riding the trolley to my GRE test site. I was so stressed, and my stomach was doing flips. A nun got on at 47th St. She sat down next to me, and struck up a conversation – asking me about my flashcards and my study plans, telling me about her job teaching English as a second language in the community, encouraging me to volunteer with her organization, and even telling me about how she had overslept and missed mass which led to her taking the trolley to one of the Center City churches. As we talked, my stress melted away. By the time we reached my stop, I was calm, collected, and finally ready to face the test.